Habit: Generally erect (decumbent or prostrate), branched or not, branches 0--9(50). Stem: 5--30 cm, [1.8]3--7.5 cm diam, spheric to cylindric [or obconic], firm to soft, not regularly segmented; ribs 0, tubercles prominent, conic to cylindric, not grooved. 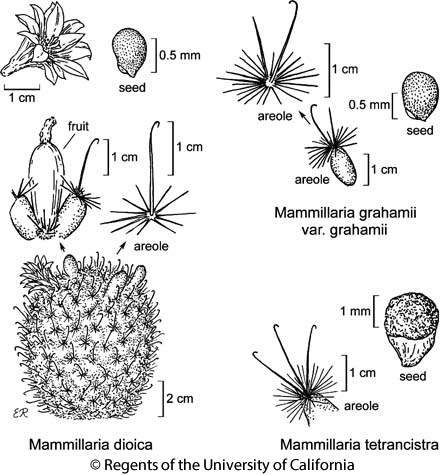 Spines: 14--64(90) per areole, < 2 mm diam, needle-like [to hair-like or bristle-like], glabrous [or plumose], straight or hooked [or curved to crinkly]; central spines 1--4 [0--many] per areole, generally hooked. Flower: lateral, in axils of tubercles, 1--5 [7.5] cm diam; perianth cream to white, pink, purple, or lavender; ovary glabrous, spines 0, scales 0. Fruit: club-shaped or cylindric to ovoid [or barrel-shaped], indehiscent, generally red, spines 0. Seed: 0.8--1.5 mm, generally shiny, generally pitted or raised-netted, black [brown to +- red or +- yellow], occasionally with aril. Stem: generally 1, 7--25 cm, 3.5--7.5 cm diam, cylindric, soft; tubercle axils bristly. Spines: central spines 3--4 per areole, lowermost 18--25 mm, 1+ hooked, tips dark; radial spines 30--60, in 2--3 superimposed ranks, 6--10(20) mm. Flower: 25 mm, 25--35 mm diam; outer perianth parts long-fringed; inner perianth parts 20--28, pink or rose-purple to lavender. Fruit: 15--32 mm, cylindric in age. Seed: aril corky, tan, >= 1/2 seed length. Chromosomes: 2n=22. Citation for this treatment: Bruce D. Parfitt 2012, Mammillaria tetrancistra, in Jepson Flora Project (eds.) Jepson eFlora, http://ucjeps.berkeley.edu/eflora/eflora_display.php?tid=32702, accessed on April 19, 2019.